Leaked drone memo: Obama can do whatever he wants to fight terrorism. That’s the lesson of the leaked drone memo. 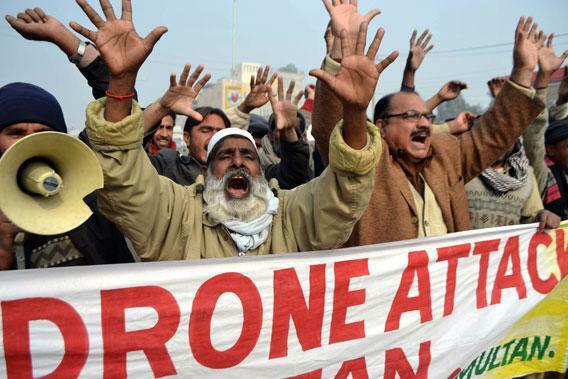 Pakistanis protest U.S. drone attacks in Pakistan’s tribal areas on Jan. 8 in Multan, Pakistan. So far, the reporting on the leaked white paper from the Justice Department about drone attacks clearly assumes that we are supposed to be outraged by the Obama administration’s legal theories, just as we were supposed to be outraged by the Bush administration’s. And outrage is being dutifully ginned up. But the memo is utterly conventional as legal analysis; its arguments could easily have been predicted. It’s most useful as an opportunity to reflect on how the law has evolved to address the problem of terror. All you need to know in order to understand the memo is that Obama administration lawyers have enthusiastically endorsed the once-vilified Bush administration decision to classify security operations against al-Qaida as “war” rather than as “law enforcement.” This was not an inevitable decision. Obviously, the use of military force in Afghanistan was a military operation, and to the extent that members of al-Qaida joined Taliban soldiers in defending the Afghan homeland against the U.S. attack, they could be killed on sight and detained without charges, as is permitted by the international laws of war. But the U.S. government could otherwise have regarded al-Qaida as a criminal organization like a street gang or drug cartel. Outside the battlefield in Afghanistan, the government would then have pursued members of al-Qaida with conventional law enforcement measures. If the administration had taken the law enforcement approach, members of al-Qaida who are American citizens would have had the same rights to due process that are familiar from everyday policing. We would send FBI agents to foreign countries like Yemen after obtaining permission from governments to conduct joint law enforcement operations. Or we would have asked foreign governments to arrest suspected members of al-Qaida and extradite them to the United States. We could not have sent drones to kill them. We would have offered them trials in civilian courts. But, at Bush’s urging, Congress did not authorize war (only) against Afghanistan; it also authorized war against al-Qaida. That meant that members of al-Qaida would be treated as belligerents. U.S. forces could shoot them on sight, just as they could drop bombs on German military formations during World War II. They could detain suspected al-Qaida members without charging them or giving them trials and hold them as detainees, just as thousands of German soldiers were held as detainees during World War II. And it doesn’t matter if you’re an al-Qaida member who happens to be a U.S. citizen, just as it didn’t matter if you were a German soldier who happened to be an American citizen during World War II. U.S. forces could capture or kill American citizens who joined German forces and detain them as POWs, and they did so. That said, clearly the analogy is not perfect, and the memo lays out a narrower standard for killing U.S. citizens than would be used in a conventional war. It must be the case that (1) an informed, high-level U.S. official believes that the individual in question poses an imminent threat of violent attack; (2) capture is not feasible; and (3) the operation complies with the laws of war. The author of the DOJ memo pulls these requirements out of his or her hat. They are formally derived from the due process clause, via the 2004 war-on-terror case Hamdi v. Rumsfeld, which in turn adopted the rule from an old case called Mathews v. Eldridge (about the right to Social Security disability benefits of all things), which provided that one must “balance” the private interest and the government interest. So the memo “balances” the interest of the target in his own life against the interest of the government in protecting other citizens, and the three-prong rule is simply asserted as the outcome of that balancing. There are several odd features of this standard that deserve comment. First, a “high-level” official (the president?) must make the determination rather than someone else in the military hierarchy, which is not the case in ordinary warfare. Nor do normal military operations require a determination that capture is infeasible before the use of lethal force. It may well make political sense for the U.S. government not to kill a U.S. citizen via drone attack without these determinations, but it is hard to see why any of this is legally required once one accepts the premise that al-Qaida, and its associated forces, pose a military threat in the same way that Nazi Germany did. To be sure, al-Qaida does not pose as much a military threat, but no one has ever argued that this makes any difference. The unstated premise must be that a roving assignment to kill anyone who is a member of al-Qaida, or seems like a member of al-Qaida, or a member of an “associated force” of al-Qaida, which may well mean any Islamic terror group or even charity, is more questionable and more subject to abuse than an order to shoot a member of the armed forces of a belligerent state. So the memo limits somewhat the degree of executive discretion by using elastic terms. (How high is “high”? How feasible is capture? What is an “associated force”?) In the end, all of this will do little to constrain anything. Second, the memo both fixates on the concept of the imminence of the threat the target poses—the word appears dozens of times—while depriving it of all meaning. It turns out that the high-level official does not actually need to believe that the targeted individual is in the process of launching an attack or is about to start one. That would be too high a bar. Instead, the memo assumes that al-Qaida is constantly planning attacks, so anyone who is an “operational leader” and “is personally and continually involved in planning terrorist attacks” against the United States counts as an imminent threat. They don’t sleep or go on vacation—they are always fair game. This is not a crazy view. German soldiers during World War II were fair game even when they were asleep in their barracks. But the question is why the lawyers would at once focus on the word imminence and ignore its meaning. The only reason I can think of is that international law says that military force can be used in self-defense only against imminent threats, and many international lawyers resist the idea that the United States can be at war with al-Qaida (because it is neither a nation-state nor a conventional insurgency) or with “associated forces,” which may be any group, anywhere in the world, that interacts with or shares the ideology of al-Qaida. And recently, nations belonging to the International Criminal Court agreed to give that court the leeway to deal with the “crime of aggression.” A drone strike against a member of al-Qaida in a country that has not given permission for such a strike would certainly count as such a crime of aggression—unless it was part of a war of self-defense, that is, a response to an “imminent” threat. Calling any use of military force against al-Qaida a response to an imminent threat may be an effort to forestall future accusations of war crimes against Obama administration officials similar to those directed at Bush administration officials. But if so, it’s a flimsy one. Obama and Bush administration lawyers have stretched the Constitution and traditional rules of international law to accommodate the threat posed by terrorism. Some people will say they violated the law. But given the political consensus supporting these moves within the U.S., it is more accurate to say that the law has evolved. It gives the president the discretion he needs, or at least wants, to address an amorphous threat. Let’s hope he uses that discretion wisely.